How do I find and repair air leak on my inflatable boat? What to do if inflatable boat compartments become soft over time? What are the differences between drop stitch air and plywood floors? How to choose a right inflatable boat? What is differences between Hypalon and PVC fabric? How to assemble Plywood or Aluminum Floor for inflatable boat? How long should I expect my Saturn inflatable boat to last? What documents are needed to register my inflatable boat? What to do if a hand pump arrives damaged? What to do if hand pump does not work? Can I use inflatable boat, kayak or KaBoat for fishing or spear fishing? What accessories come standard with Saturn inflatable boats? 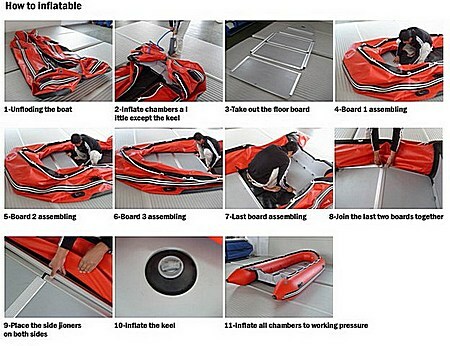 How to fold inflatable boat for compact storage? Do I need to install a hydrofoil on the outboard motor for inflatable dingy? How to protect air floors from accidental punctures or sharp dog claws? How to properly tow inflatable dinghy behind a sailboat or yacht? How can I prevent the outboard motor from damaging the transom while transporting my boat on a trailer? What type of outboard motor can be installed on a Saturn inflatable boat? Are Saturn inflatable boats certified or approved? How to properly operate inflatable boat air valve. 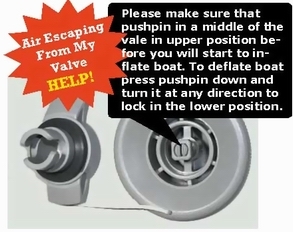 How do I replace the air valve in my inflatable boat, kayak or raft? What outboard motor do I need to put inflatable boat on plane? What are the steps to correctly assemble inflatable boat with hard floor? What is the working air pressure, and do I need a pressure gauge? How do I tie up my inflatable dinghy boat to the dock? 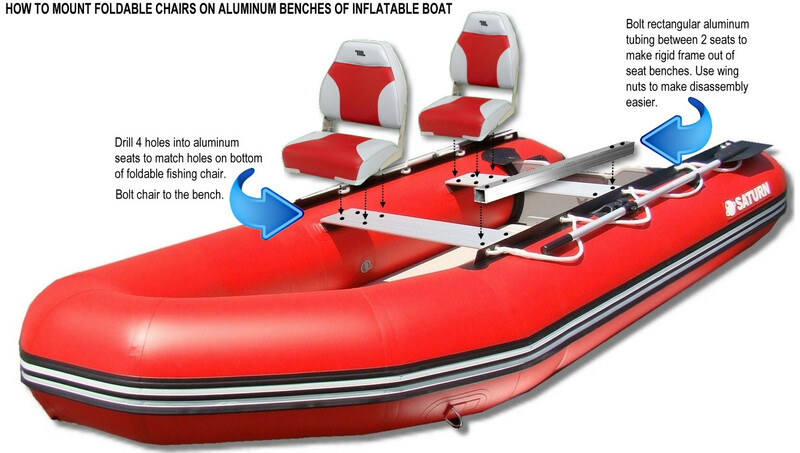 How to make inflatable boat seat bench to be softer on a bumpy rides? How to make swim ladder to get into inflatable boat from the water? How to properly load inflatable boat? Where do I get a Bill of Sale and Manufacturer Certificate Of Origin in order to register my boat? The keel tube under the floor is skewed to one side. How to fix it? How can you avoid slipping in the boat seat while the boat is in motion? What to do if water slowly leaking into inflatable boat? How to minimize pressure on seat bench by heavy person? Can inflatable boat be fixed if it get a really big cut? How to set up trailer for inflatable boat? How to quickly make valve replacement tool out of PVC pipe? How to install foldable fishing chairs on inflatable boat aluminum benches? How to install registration numbers on an inflatable boat? Why my hard aluminum floor inside boat had developed cracks in side rails? If you are losing air pressure, (aside from pressure loss commonly caused by colder temperatures), check the boat over for air leaks. Air must to escape somewhere for air chamber to become soft. No magic here. The best tool to find air leaks is soap, shampoo or dish detergent mixed with water in a spray bottle or bucket. Start by checking the valves first. Spray around the valve on a suspected air chamber. If you see bubbles forming, check your valve fitting and base and be sure the valve insert is screwed on tight and pushpin is in correct position. See FAQ below for more help with leaky air valves. To find tiny leaks on a boat surface, fully inflate the boat until it's hard to the touch. Put some liquid detergent in a bucket of water and scrub it all over the boat with rag, towel or big wash brush. Watch for tiny bubbles. When you find the first leak, keep looking. You might as well fix them all at the same time. Remember, the number one cause of slow leaks is due to poorly fitted valves. Unscrew the valve and clean the area. Make sure the little rubber O-rings are still good. They are the cheapest repair possible. Divide air chamber surface into imaginary squares, and apply soapy mix to that square and then look against surface to see for bubbles. If no bubbles are appears after 5-10 minutes, then move to another square. Don't forget to apply soapy water all along seams. Use soapy towel to apply solution over large areas. 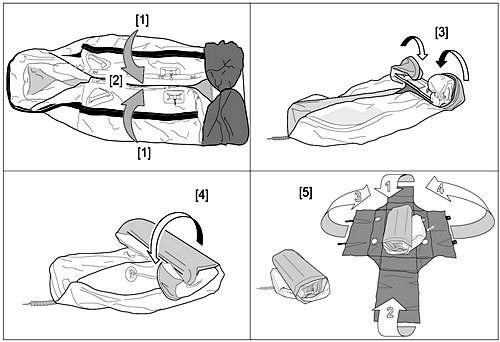 Summary: If inflatable boat has lost air pressure, it does not always mean it air is leaking. If product was inflated during the hot time of the day, and then later on temperature dropped during the night, then your inflatable boat will be softer in the morning of following day. Visually inspect inflatable boat for signs of holes, cuts or punctures. Check the tightness of air valves. If necessary, tighten them with black valve tool provided inside orange repair kit. Try to listen for air leak, as you may be able to hear hiss of air escaping and pinpoint source that way. Inflate leaking chamber to high pressure. Spread lots of soapy water all over leaking chamber with a hand towel or large sponge. Don’t assume the leak is coming from the air valve or seams. Don’t assume there is only one leak. Spray bottles may not be as effective at locating small leaks on large surface areas. All inflatable products, including dinghies, kayaks and rafts are tested at our factory. They are kept fully inflated for 48 hours after the SATURN logos are applied to the product tubes. Therefore, it is extremely unlikely that brand new inflatable products are leaking air right out of the box. If air is escaping rapidly from a valve when you inflate your product for the first time, then most likely you are not properly locking the air valve. If you leave your boat fully inflated, come back in a couple days or weeks and the air chambers are soft, then there are only 3 possible reasons for that: micro puncture somewhere on a fabric surface, leaky air valve, and least likely is a leaky seams, which is definitely a warranty issue. Please note, that since air chambers are separated by inner baffles, it is possible that air leak in one chamber will cause other chamber to become soft too. In this case you will need to pinpoint which chamber is actually leaking air. To do that you will need to deflate other chambers, and inflate only one chamber at the time to the full air pressure, and then see if it will get soft overt time, or if you can find air bubbles anywhere with application of soapy water. If inflated chamber holding air good and no soapy bubbles are observed, then it mean that some other chamber can be compromised. Repeat same operation with different chambers until you will pinpoint leaking chamber. If you suspect that a valve is the source of the slow leak, you can verify this by fully inflating the air chamber, closing the valve cover and applying a soapy water mixture around the valve housing and cover cap. Air may escape around the valve plastic body perimeter, cap body perimeter, or in the place where the string securing the valve cover cap enters the valve housing. If air leak is very slow, it might be difficult to immediately detect air bubbles. Try to press on air chamber to increase pressure or leave for couple minutes. If valve is leaking, then you will see small bubbles forming in a place of air leak. Over time, it is possible that debris, sand, dirt, oils and grime will accumulate on the rubber seal ring that is designed to keep the valve air tight. That may allow a small amount of air to slowly escape, making the tube and chambers soft. To remove debris you will need to blow air into the open valve with a hand pump while keeping the hose slightly away from valve's unlocked pushpin. It might be also possible to splash a bit of acetone inside the valve to clean off the dirt and grime. Leave the valve open to let the acetone evaporate. If that does not help, remove the valve with a special valve tool, clean the rubber seal with a cotton swab soaked in acetone and re-install the valve with a tight fit. If that does not help, then valve needs to be replaced. If you are observing air bubbles around the valve housing perimeter while applying a soapy mixture, there is a possibility that the valve needs to be tightened with a specialized valve tool. Such tools may be purchased or borrowed at https://www.BoatsToGo.com/valves.asp. It should also be included with your repair kit. 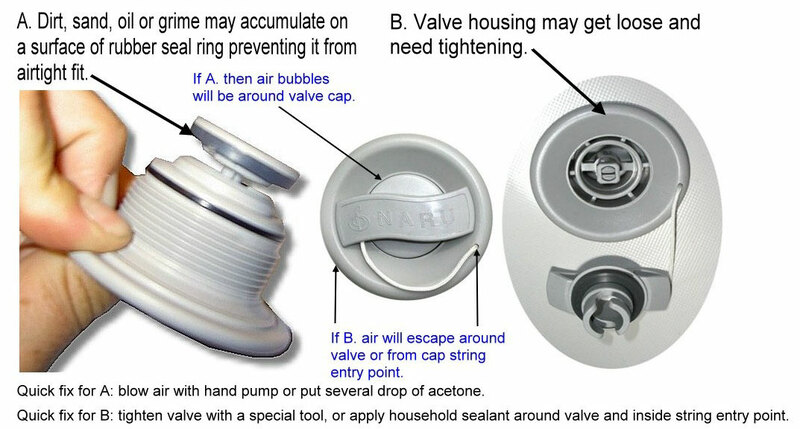 You can also quickly seal the slowly leaking air valve by applying a thin layer of glue around the valve housing perimeter, or putting a drop of glue inside the opening, where the string that secures the valve cover enters the valve housing, if you observe air bubbles at that particular place. Household silicone sealant may also be applied in place of the glue. What are the differences between drop stitch air and plywood or aluminum floors? Once inflated, a high pressure air floor becomes as rigid as a plywood floor. You can stand, walk or even jump on it, the same way you could on plywood floor. If you are planning to inflate and deflate your boat often, then the air floor is your best solution, because the boat folds compactly. It's a breeze to assemble and inflatable boats with air floor. Just roll out-and inflate. Assembling a plywood floor is a little bit of a hassle, and therefore we recommend plywood floors only if you keep the boat inflated most of the time. Another advantage of an air floor is that it is much lighter then a plywood floor. Due to it's lighter weight, the boat can achieve a higher speed much easier then with a plywood floor. Plus, an air floor is easy on your knees and absorbs vibrations better then a plywood floor. Because of these outstanding features, most of our customers prefer boats with air floors. Customer's video comparing High Pressure Air Floor to Hard Sectional Aluminum Floor. All of our air floors come with a plywood support above the keel in the bow section of the boat. Because of these patented features, air floors become very rigid and flat. Flat floors perform much better then bended air floors of some competing brands. Please see all technical specifications for Saturn inflatable boats at https://www.BoatsToGo.com/inflatable_boats.asp. Max persons capacity displays how many persons the boat can transport safely. 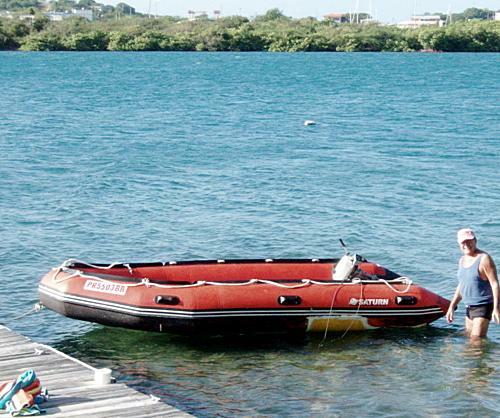 In general, to be comfortable on an inflatable boat, you will need to deduct 1-2 persons from the max boat capacity. For example, SD260's will comfortably seat 1-2 people, SD290/330's 2-3 people, SD365/385 3-4 people; SD430's will accommodate 4-5 people comfortable. It is much easier to inflate and deflate boats with high-pressure air deck floors than boats with plywood floors or hard floors. It takes more time and skill to assemble plywood floor. In general, if you are planning to inflate/deflate the boat often, then select a boat with an air floor. If you keep the boat fully inflated for at least 1-3 weeks then choose a boat a with plywood or hard floor. If you keep boat on a trailer or in a dock, then a hard floor will not be a problem for you. If you keep the boat in the car's trunk and inflate it for only a day of fishing, then you will find it easier to deal with an air deck floor. There are two main types of fabric that most inflatable boats are made of. They are either PVC or Hypalon. Most Mercury, Sea Eagle and Zodiac inflatable boats are made of PVC. 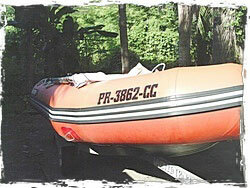 Caribe, AB and Achilles inflatable boats were made of Hypalon in past. However Hypalon was discontinued by its manufacturer Dupont, and now it is sold under different name CSM. Pro - Significantly less expensive then Hypalon. Con - Won't last as long in the direct sunlight as Hypalon before it starts to fade out (if left unprotected). Does not tolerate sunscreen and insect repellent as well as Hypalon. Pro - Will last significantly longer than PVC when exposed to prolonged periods of direct sunlight. Will tolerate fuel spills, sunscreen, insect repellent, and exhaust fumes better than PVC. Con - Significantly more expensive then PVC. In general PVC fabric won't last as long as Hypalon fabric if the boat will be subjected to prolonged periods of direct sunlight and no measures have been taken to protect the PVC fabric from the sun (i.e. 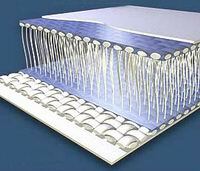 boat cover or UV protectant). After a number of years in direct sunlight the PVC fabric will become sticky and fade out. Exposure of PVC inflatable boat to direct sunlight is not a problem unless your boat is going to be outside and unprotected all year long. If you only use the boat occasionally such as on weekends or while on vacation then it isn't a factor at all. Even if you leave your boat outside all the time the issue can be solved simply by putting a boat cover or piece of tarp over your boat when it is not in use. Please visit the Hard Floor Assembly page if you have difficulties installing your plywood floor into your inflatable boat. You may also download a Plywood Floor Assembly manual. First of all - do not panic. Most inflatable boats, rafts and kayaks have several air chambers, and if one of chambers gets punctured, the boat will stay afloat due to the buoyancy of the remaining air chambers. Inflatable air chambers are separated by internal baffles that keep chambers separate in case of accidental puncture, and designed to equalize air pressure between all interconnected chambers. If boat gets punctured below the water line, there is nothing much you can do except for pumping air with a hand pump in order to slow down the air leak. For quick emergency repairs in ripped inflatables, you can purchase a ClamSeal. Punctures in accessible places, inside the boat, can be temporarily fixed with a piece of duct or Gorilla tape. To insure a good seal, the area around the puncture should be cleaned with acetone before applying duct tape. After that, you can pump in air to slow down the escaping air, and get ashore as soon as possible. That is totally up to you. If you take good care of your boat, it may last 5-10 years. If you do not take proper care of the boat, it will only last up to its warranty period. However, abused and mishandled boats are not covered by the warranty. To extend the lifetime of your boat by taking proper care of it, we are recommending following book: " INFLATABLE BOATS - Selection, Care, Repair, and Seamanship " by Jim Trefethen. ISBN number 0-07-065252-X. Available at www.amazon.com, or you may order it from the publisher: The McGraw-Hill Companies, 1-800-262-4729. It is well known that the most common reason for premature boat aging is exposure to the sun and its damaging UV rays. Fabric discoloration, fading, breakdowns and damages to varnished plywood can be all attributed to direct sun exposure. The solution is simple - when the boat is not in use, cover it or deflate it. There are plenty of Inflatables rotting under the damaging sun in any local marine or harbor. If possible, deflate the boat, clean it and store it in its carry bag. If the boat is constantly dragged behind your sailboat, left year round on a dock, or left dirty and directly under harmful UV-rays, you can't expect it to last forever. If you use a boat cover , or at least cover boat with a piece of tarp, your SATURN will last much longer. Try to keep the boat clean and free of chemical detergents and sun screen lotions that may discolor the fabric. We highly recommend boat cleaners available at the Inland Marine USA web site. Please use ONLY cleaning solutions that are approved for PVC fabrics. Do not use CLOROX, Windex or any other household cleaners. These chemicals will make the fabric sticky over time. Sun screen lotions may contain silicon that will also make PVC fabric sticky. Clean the boat tubes of any sun screen lotion marks to extend the boat fabric life cycle. Your local West Marine store always carry number of inflatable boats cleaners, protectants and boat paints that will help to keep your inflatable boat as good as new. We also recommend very convenient Swipes Wipes , as they contain an excellent cleaning solution for inflatable boats. These wipes remove any type of dirt, protect against UV-rays and can make the boat look new again. Here is two identical 4-years old Saturn boats purchased at the same time and owned by two different customers in Puerto Rico. One boat was never covered, another was cleaned and covered with a boat cover. Guess which one of above boats was covered and which one was left under the sun? A reminder to all of our friends and customers in the hot and humid areas of South Florida, Texas, LA and the likes. Please keep in mind when storing any inflatable raft or flotation device that your garage can easily reach temperatures of 100+ degrees in the heat of summer, not to mention swelter in unprecedented levels of humidity for months on end. This unnecessary and easily avoidable exposure to constant moisture is known to corrode away at the integrity of the chemical bond used to weld your inflatable together. It is recommended by us here at Saturn that you always cover your inflatable when not in use, and when possible deflate so that you can store away within a climate controlled area of your house. Also note that if you are unable to pack away your inflatable to always reduce the amount of pressure within the tubes and floor as heat exposure will cause the air contained within the vessel to expand, ultimately resulting in a burst seem. The few extra minutes spent packing away your PVC inflatable watercraft will dramatically increase its durability and longevity helping minimize weekends lost to ruptured seams. If you will take proper care of your inflatable boat, it may last well over its warranty timeframe; over 10 years! See example of this Craigslist ad posted in March of 2015 advertising 2003 Saturn inflatable boat in a great condition. You will need a Manufacturer's Statement of Origin (MSO) and Bill Of Sale. The MSO and Bill of Sale are enclosed in a pouch attached to the shipping box along with a Warranty Registration card. If any of these documents are missing from the pouch, please visit the Downloads page for replacements. Please fill out all necessary information: purchase price, your name, address and date of purchase. Please email if you have questions. Don't forget to enter the correct HIN number that can be found on a transom of your boat, or side of shipping box. HIN number starts from letters VEJ. DO NOT bring blank forms to the Tag agency. Fill them out first. If asked for Federal Tax ID, please use these number: 20-4161513. In very rare cases, some states may ask you to provide the MSO with a signed and notarized First Assignment. In general this absolutely unnecessary. The First Assignment is for you to fill out when you are going to re-sell the boat. BoatsToGo, Inc represents manufacturers in the US and a signed first page should be more then enough to register your boat. There are no manufacturers in the US who provide a notarized copy of the MSO. However some offices are just giving a hard time to customers. If it is absolutely necessary, we can provide a notarized copy of the MSO for a fee of $10. This is what the notary public charges us for the seal. Please visit https://www.BoatsToGo.com/payment.asp to send $10 payment if you need notarization. 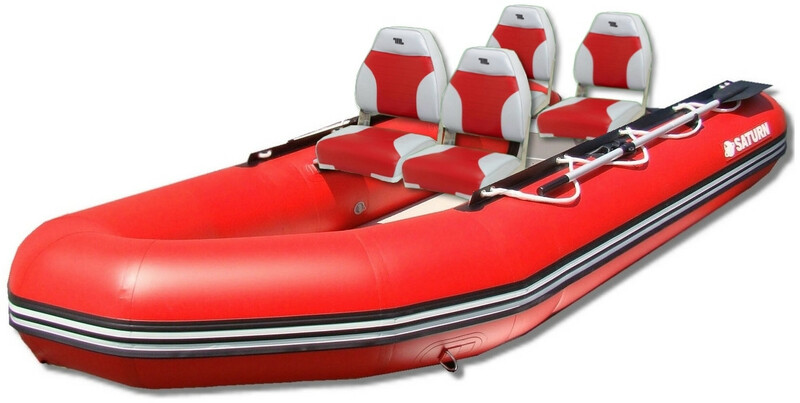 Saturn inflatable boats and rafts are of excellent quality and workmanship. However, in efforts to pass the savings on to you, we are keeping costs as low as possible. Instead of enclosing a high quality and expensive hand pump, and then passing the cost to you, we are enclosing good quality generic hand pumps. The hand pump enclosed with the boat is free and is a complimentary gift to you. In rare occasions, if FedEx drops the shipping box during handling, the hose of the pump may get squeezed by the weight of the boat and develop small cracks. The simplest and fastest solution for cracks in a hose would be to apply duct tape around the hose. This will make the hand pump fully operational again. However, if you wish to receive a new pump, please send damaged pump back for replacement. Click here for return address. If the hose is fine and the pump doesn't provide enough pressure to inflate the boat, then unscrew the green cup with a T-handle and inspect the rubber seal on the plunger. If it's torn, let us know and we will send you a replacement seal. Please note that high-performance manual and high-pressure electric pumps are available from our Accessory section. The Saturn boats, rafts and kayak should be inflated until quite firm. If you find the hand pump provided is not able to achieve enough pressure, inspect the hose and all connections for leaks. Remove the hose and block the air outlet at the T handle with the palm or your hand while pushing down on the T handle. You should encounter very substantial resistance to pushing down when the air outlet is blocked. If instead the handle goes down easily, open up the pump by unscrewing the green cylinder lid and inspect the black rubber seal to see if it is torn or improperly installed. On the end of the plunger you will see 3 ridges: A top ridge, a 2nd ridge that is just below the top one, and a bottom ridge. When the black rubber seal is properly installed it is in the valley between the top ridge and the 2nd ridge, and it covers the 2nd ridge. Photo shows proper location and orientation of the black rubber seal. The seal is bell-shaped so that its upper opening is smaller in diameter than its lower one. If it is upside down, remove it and turn it over. If it is in the wrong location (i.e., if it is below the 2nd ridge instead of above it), move it to the correct place as shown in the photo. Once the rubber seal is properly situated, re-assemble the pump, taking care not to damage the seal. Use your fingers, and the fingers of a helper if necessary, to stuff the edges of the seal into the cylinder so that it does not get displaced or damaged as you insert it. Make sure you apply enough grease. Any of our Inflatables can be used for fishing, diving, snorkeling, spear fishing or any other fun sport activity on the water, as long as it's safe. However, please exercise caution while handling fish around Inflatables. Pectoral fins of most fish are extremely sharp and can easily puncture any PVC or Hypalon fabric. If you just throw fish inside your inflatable boat, there is a risk that the fish may jump and accidentally puncture your boat. Pectoral fins of many fish are so small and sharp that they may create micro punctures that will not be noticed immediately. Most likely, punctures by fish fins will cause slow leaks that may take several days to notice. It is easy to fix micro holes by simply applying a drop of glue. However, to avoid the possibility of such accidental punctures by fish, we recommend dropping fish inside a basket or cooler, or to keep a collapsible fish basket attached outside of the boat with a rope. It is advisable to avoid direct contact between the live fish and the air filled chambers. All boats come with 1 seat bench. All boats come with a hand pump, repair kit, carry bag, aluminum oars, 4' rope and either an air or plywood floor. Depending on a model, 2nd bench can be provided when order is placed on-line. Optional accessories: boat cover , under seat storage bag with cushion , extra plywood seat , valve adaptor for electric pump , do-it-yourself plans for building sun-shade canopy , etc. We are constantly adding new accessories. Please visit our Accessories-Parts page for all optional accessories and spare parts. Click here for step-by-step instructions for deflating and folding your boat. We recommend that you install a hydrofoil on the outboard motor in order to improve speed and boat handling. A Hydrofoil will help put the boat on plane much faster and will help maintain the planning effect at lower speeds. See picture below, on the left without a hydrofoil, on the right with a hydrofoil installed. You can find hydrofoil in West Marine, on-line or Wal-Mart boating section starting at $25. An air floor PVC material has been designed to be strong and puncture-resistant. But if enough pressure is applied with a sharp object, like a knife or fishing hook for example, then a puncture may sometime occur. Dog claws, in general, are not sharp enough to puncture an air floor. But small pieces of sharp broken glass or similar objects may stick to the insole of shoes while boarding the dinghy and may also cut the surface of air floors in some cases. To avoid damage to the high-pressure air floor, and keep it as good as new, you can purchase a piece of vinyl floor covering in a hardware store, or just use regular carpeting. Cut the vinyl or carpet to fit the inside of the boat and over the floor. Use paper patterns first, to get a perfect fit. Then use this paper pattern to cut the new flooring. Applying vinyl or carpet covering will make inflatable air floors virtually indestructible. Floor vinyl covering or carpet is flexible and may be rolled up for storage when boat is deflated. Towing bridle is necessary in order to properly tow your inflatable boat. Towing bridles are available at many marine retail stores and on-line. 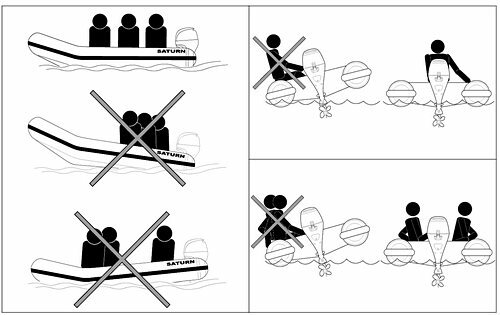 Do not tow the inflatable boat by connecting rope to the central D-ring with integrated handle. Use towing D-rings on both sides of the dinghy bow. The most common mistake made when towing is the improper use of the towing bridle. Many boaters knot the tow bridle into a loop at the center, and attach a towing line there. This is wrong. The towing line should not be fixed to the bridle, but instead should end in a small bowline loop, through which the bridle passes. This allows the towline to slew back and forth in the bridle, and provides for tension on both sides of the bridle. Not rigging the towline this way is the most common cause of failure of the pad eyes on the dingy to which the tow bridle is attached. It is inevitable that during towing, the dingy will rock a little from side to side, shifting the strain on the bridle from one side to the other. If the towline is rigidly fixed to the center of the bridle, one pad eye will be momentarily required to sustain the entire tow load. 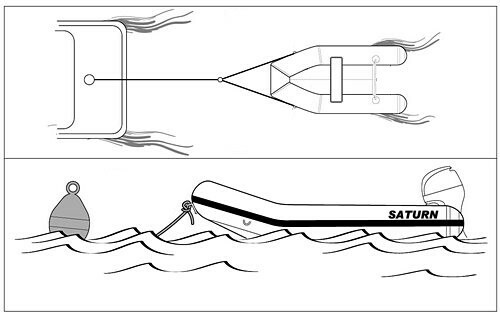 If the towline can shift its position in the bridle, both sides of the bridle will remain in tension, and the load will be distributed to both pad eyes on the dingy. Many cruising sailors have small outboard motors for use with their inflatables, which creates a dilemma when it's time to tow: should the motor be left on the dingy while towing? The tendency to do this is proportional to the weight of the outboard and the difficulty in removing it and storing it on the boat. There are a number of reasons for recommending against towing with the outboard on the dingy. First, there is the hazard to the outboard. In large seas the dingy might flip over, submerging the motor. It's also possible that violent motion in the seaway could cause the motor to fall off the dingy transom. These things always seem to happen when you'd least expect them to, usually when a ten-foot sea is running! Another consideration is the additional tow load the extra weight of the motor will create. A completely empty inflatable is usually a very light craft and hence a very light tow load. When you add 70 pounds or more of motor and gas tank, you could very well be doubling the tow load from a small inflatable. The problem most likely to occur in towing the dingy is shipping water aboard. It can quickly lead to failure of the bridle pad eyes, especially in those instances where the load is not being equalized. Even just six inches of water in an inflatable can weight hundreds of pounds. While transporting inflatable boats on a trailer with the outboard motor in a raised position, heavy outboard engines may provide extra strain on a boat's transom. When a moving trailer hits a bump or uneven pavement, heavy motors are capable of damaging the transom. You can install a pole support from the end of the trailer to the end of the outboard motor in order to provide extra support for the motor's weight. These supports are available at places that sell trailers for boats and/or on-line. You will need to use a hand pump to provide proper air pressure to the tubes if you are using low pressure electric pump. Inexpensive electric pumps sold for $20-$50 in retail stores will not provide enough air pressure, and your boat will not operate to it's full performance. You may quickly inflate all air compartments with low pressure inexpensive electric pump, up to the point where no more air can be electrically pumped inside, or about 80-90%. Then, you will need to use a hand pump until the tubes, keel and bow are hard to the touch. To completely inflate boat or kayak or raft or any other inflatables to the recommended air pressure without use of hand pump, you will need a special High-Pressure Electric pump sold in our Accessories section. Saturn Inflatable boats are made of the same quality materials as famous expensive brand name inflatable boats. The workmanship is exactly the same or even better quality then most overpriced brand names that you can buy in retail marine stores. 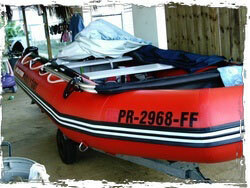 SATURN Our SATURN boats are made by a major manufacturer of inflatable boats in Korea. Short shaft 15" outboard motors are recommended to be installed on the 15" transom of Saturn inflatable boats. The lighter the outboard motor - the better. Either 2-stroke or 4-stroke engines may be installed on a boat transom, however 2-stroke engines are generally much lighter then 4-stroke outboard motors. Long shaft 20" motors are not recommended, but may also be installed if a short shaft o/b is unavailable. However a long shaft o/b may create extra underwater drag. Long shaft o/b may be raised a few inches with the help of a 2-3" wooden bar placed on top of the boat's transom. Max O/B motor, as per technical specifications for Saturn inflatable boats , means that this particular HP power output motor will bring the boat on plane when the maximum persons capacity is reached. For example, the SD365 can take up to a 30 HP outboard motor, but a 9HP or 15 HP motor will move this boat very nicely with 2-3 people on board. However, to put the boat on plane with a full load of 5 people and gear, a 30 HP motor may be required. Manufacturer Identification Codes (MIC) were assigned by the US Coast Guard on May 6, 2003. Our boats have been CE, ISO and Germanischer Lloyd Certified in Europe, Asia and Australia. The NMMA certification is expensive and optional, therefore we did not applied for such a certification in order to keep our expenses/prices as low as possible. The valve has a special pushpin inside. This pushpin has two positions, both up and down. When it is pressed in the down position, air will escape. If you turn the pushpin in any direction it will pop up. This will lock air inside and prevent it from escaping through the valve. Before inserting the air pump tube into the valve, please make sure that the pushpin is in the upper, popped up position. Once the pin is in the "popped up" position, insert the air pump tube into the valve and inflate the boat until it becomes hard. Once you remove the air pump, air will seal the valve and will no longer escape. If you would like to deflate the boat later on, press down on the pushpin and turn it in any direction until it stays in the pressed down position. Air will immediately escape from the tubes thru the valve. Please go to the valve assembly page to see how a damaged or defective valve can be replaced. Replacement valves and tools for their replacement can be ordered at https://www.BoatsToGo.com/valves.asp. Top part of the valve can be simply unscrewed for cleaning or replacement. New valve can be screwed in place of old one. In most cases, simply cleaning rubber seal inside the valve will fix slow leak that may develop over time due to the grime and residue collection on top of that seal. Under normal circumstances, with half of a maximum persons/load capacity, or about 50% of the maximum O/B power rating may be necessary to put the boat on plane. For example: the SD365 is rated for up to a 30 HP outboard motor. But a 15 HP with hydrofoil installed would be enough to put a 12' boat on plane with 1-4 people and a light load. The lighter the motor, the faster boat will run. 2-stroke engines, while still possible to find, are much lighter then 4-strokes, and will provide same power at less strain to the transom. Max O/B Motor means: the maximum power outboard motor that can be safely used to plane a boat loaded to the maximum capacity on normal water surface conditions. Please exercise common sense and caution when using maximum motor capacities. Do not jump from wave to wave as new 4-stroke motors are much heavier then 2-strokes and provide extra strain on the transom. Inflate all tubes to approximately 75% full. Insert boat seats in designated spots. Place deflated air floor inside the boat. The gray plywood board should be facing the keel. Make sure that the valve of the keel is accessible through the hole in the air floor. You will need it later to inflate the keel through this hole. Place both ends of plywood boards under the left and right sides of tubes. Stretch the air floor along the boats bottom, so it covers it from nose to transom. The rear end of the air floor should be touching the transom. Inflate the air floor until it's hard. You will know that the floor is fully inflated when the air pressure starts pushing the air pump handle up. Inflate all tubes 100% until hard to touch. Inflate the keel through the hole in air floor. Please see this FAQ about importance of proper inflation of boat tubes and keel. It is not necessary to have an air pressure gauge to inflate Saturn boats. The boat tubes are equipped with Safety valves that will prevent over-inflation. In general, when you feel that boat tubes/floor are hard to the touch, and it becomes difficult to pump any more air in, that means that the boat is ready. However, if you are using a high-pressure electric air pump, please use below guidelines to avoid boat over-inflation and consequential damage. 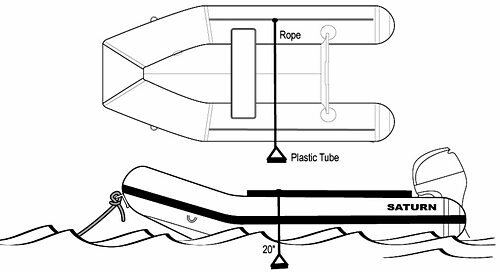 If you are planning to keep your inflated dinghy in water or by the dock for extended periods of time, here is a simple scheme that you may follow. Gray PVC 1/2" electric pipes can be used as pole supports. PVC pipes are available in local hardware stores and Home Depot. They provide enough tension to keep the dingy from rubbing against the dock. However keep in mind that prolonged exposure to open water will cause extensive algae and barnacle growth on the bottom part of the boat. Here is a web page with a FREE instructions for how to make Deluxe Soft Cushion that will go over your boat plywood or aluminum bench. This is complimentary instructions for DIY project provided as-is as a gift to our customers. We will not be able to provide any other information besides already provided on that page. You will need 8-9 inch long pieces of 2" diameter white plumbing PVC pipe and a piece of thick rope. Drill holes at the end of each pipe and run the rope from one hole to another. Make 2 knots where the rope exits the holes in the pipe, to make sure that the pipe will stay in place and will not slide when boarding the boat. Make knots along the rope to assist with pulling yourself out of the water. Attach rope to the grab line, or any other place that can support heavy weight and throw the other end of the rope across the boat into the water, so that it is 20" below water line. When boarding, insert one foot inside the loop with the pipe and grab the rope with both hands. Pull your body inside the boat, by using knots on the rope to help you up. If the Bill Of Sale is missing from the shipping pouch or you need replacement documents, you can download the necessary paperwork by clicking on the Downloads link. Please follow these steps to correct positioning of the keel. 2. Deflate and remove air floor. 3. Inflate keel and then deflate it while spreading it out evenly on both sides. 4. Insert air floor back and inflate boat tubes 100%. 5. Inflate air floor, then inflate keel. There are 3 major reasons for cavitation problems. First, is an incorrect or damaged prop. The second, and most likely, is that the boat is not fully or properly inflated. If the boat's chambers are not fully inflated, this will cause water disturbance under the boat tubes, and cavitations as a result. Please make sure that the boat is fully inflated by using hand pump. Do not use only electric pumps or compressors to inflate the boat. Use a hand air pump to pump up all boat chambers until they are hard to the touch. In general, once you feel that it becomes difficult to pump any more air with a hand pump, it means that the chamber is full. You can lightly knock with your hand on each compartment and it should feel hard, not soft. 3rd, and often overlooked reason for cavitation is seaweed and/or debris in a water stuck to outboard skegs or prop. Even a little bit of seaweed or piece of plastic bag stuck in small outboard can cause it to cavitate. Easiest fix for that is to put motor in a neutral, and clean debris around prop. Make sure prop is not rotating. The most recent response from a customer who fixed cavitation by properly inflating his SD365 boat was: " Thanks, I did what you said and went out in the ocean today and my boat ran great, really moves with this Honda 20hp outboard." Anti-ventilation Plate: A large plate cast into gear case housing directly above propeller. Helps reduce surface air from being pulled into the blades. "Oh happy day!!!! Took the boat out with the new propeller 8 pitch and the boat cruised along like a champ, you may want to let people know it they are at high altitude lakes the pitch of your propeller should be at the lowest level available for your motor type. I'm so happy my boat works, can't wait to go again!! Thanks for all your help with my issue." You can apply a non-slip stair tread tape which is manufactured by 3M. It is very durable and is water resistant as well. It is available in most hardware stores. It is made to be used on stairs but also works well on boat seats to keep you from slipping into turns when a boat is in motion. It makes the seats non-slip! Most likely place where water can enter inflatable boat is a one-way drain valve. There are several reasons why water may sip into the boat, and fixes are usually quick and easy. Drain plug is not fully inserted. Please make sure there are no debris on a plug, and press on drain plug to make sure it is all way in. One-way rubber seal that lock the valve is dirty, or there are debris under the seal. Pull rubber seal with your finger and inspect for debris stack between seal and plastic housing. Wipe rubber seal with an acetone. Drain plug assembly got loose or not enough sealant under the drain valve. Tighten screws on a drain plug while avoiding cracking plastic part. 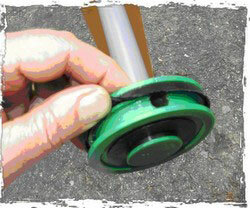 Apply door/window clear silicone sealant around drain valve assembly. Replacement drain plug assemblies are also available per request. Put a regular cooler between the seat and air or plywood floor to create extra support for the plywood seat. The cooler has to fit under the seat. There are IGLOO or Coleman coolers available in department stores that are just the right size. Coolers can also serve as dry storage containers. When a boat is jumping on waves, coolers will prevent excessive pressure on the strips that hold the plywood seat attached to the tubes. For example, a Coleman 9 Qt. Excursion, Red cooler, dimensions 11.25" x 12.66" x 9.75", Vendor Part Number: 6209A703G, around $15. "Below is not a very good photo, but it may serve to remind you of the 4 foot gash I had on the port chamber of my 14-foot Saturn. Since this was taken, I have put on the big motor and been bopping all around the huge bay of Culebra, PR. She runs like new!!! I can hardly believe it. Most boat people here never thought the gash could be fixed. What you see here is only the top part. As you get further under the chamber, the tear continues for another 2 feet toward the stern. I had a local guy here stitch first from the inside, then from the outside. He began layering the patches, using 5200 Sealant. It still leaked after that, but only thru small pinholes. It was then I I found at Inland Marine an expensive liquid adhesive that gets applied from INSIDE the chamber. Then the boat gets rocked back and forth to spread the glue evenly. I gave it 2 "coatings" on 2 separate days. Then I went all around the perimeter (edges) of the patch again with a fresh application of 5200. And voila, it sealed perfectly, not the slightest leak. Regular Jet Ski trailer will work just fine for almost any inflatable boat. You can find used Jet Ski trailers at Craigslist.com, or look up in local classifieds. Harbor Freight Tools offers very inexpensive foldable utility trailers that can be converted into boat trailer. Please see bellow excellent video of trailer setup submitted by one of our customers. Click on Play button to start. The material used is inexpensive "1" size PVC plumbing tube. It is available at any home center or hardware. Mine was a scrap from another project. The work done is simple filing, or hand cutting, 6 little grooves into the end. That particular PVC pipe fits very closely into the NARU valve circular opening, after a little sanding is done. After proper filing of the 6 little grooves, and the sanding to fit the circular opening, it will fit over the 6 NARU valve structural parts, and allow a safe removal of the internal valve component by turning it counter-clockwise...Re-Assembly is obviously the reverse. This tool works exactly like a specialized SOCKET TOOL for mechanical work. I felt PLASTIC to be more compatible with the plastic valve, thus preventing potential breakage or cutting of the plastic valve components. How to mount foldable chairs on seat benches? Install rectangular aluminum tubing in between 2 seat benches. This will create rigid aluminum frame and will prevent benches to rolling backward when resting against back support of chair. Use wingnuts to make assembly/dissasembly quicker. Then drill holes in benches to match holes on bottom of foldable chairs. You can bolt chairs directly to benches, or install swivel platform with quick release mount to make chairs rotate and quickly disconnect from benches. How to install registration numbers on a boat? It is very important to have boat tubes and keel to be inflated as hard as rock. Recommended air pressure for tubes is 25kpa, and keel is 30kpa. Inflatable boat tubes and keel are designed to work together in order provide lateral support for hard floor inside boat’s hull. Inflatable boat is not properly inflated if there is sagging or wrinkling on a side of tubes, or when tubes or keel feels soft to the touch. If keel is not fully inflated, or tubes are not hard enough, then all weight of heavy tubes are placed on floor boards, at the time when boat hull is gliding over waves, choppy water or when boat is accelerating. Floor boards by itself are not designed to support heavy weight of the boat tubes and/or boat passengers, which might reach in hundreds of pounds of weight. Floor boards designed to work in conjunction with boat hull and keel. Fully inflated keel designed to keep floor flat, so that to minimize stress on side rails and floor board stringers. In addition, boat tubes also squeezing floor boards via side stringers in order to keep floor board in strait line. If keel is soft, there is nothing to provide support for floor boards, and that can result in excessive stress on side rails which might result in cracking or damages to floor boards. Please note that improper boat inflation will void warranty on damaged floor boards. Also, when boat tubes are underinflated, it is possible for stringers to move out of its position over side rails, those reducing support for floor boards, which would surely result in side rails cracks. Please send us your questions and we will add them to this FAQ list.